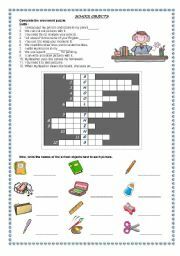 A matching worksheet to practice the difference among Do,Go and Play. A simple reading to practice the difference between gerunds and infinitives. And some comprehension questions about the text. 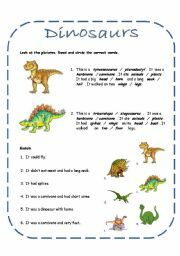 A worksheet to practice description of a bedroom using the different forms of There is - There are and prepositions of place. Answer key is provided. I hope you like it! It looks a little small in the preview, but it�s fine when downloading. It covers the whole page. 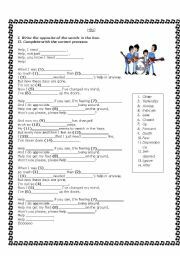 The lyrics of a very well known Beatles� song in order to practice some pronouns (personal, indefinite, etc) as well as some opposite words. Students can listening to the song and complete. Then, sing and enjoy! An easy worksheet to practice the vocabulary about classroom objects. 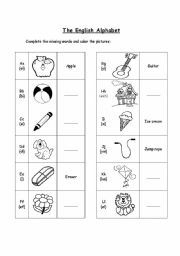 A worksheet with the letter sounds and pictures (specially made for children). Students complete and color. I hope you like it!